Scia has announced the new SCIA Engineer 16, IFC certified Open BIM structural modeling, analysis, design, code checking and reporting software for structural engineering workflows in AEC. 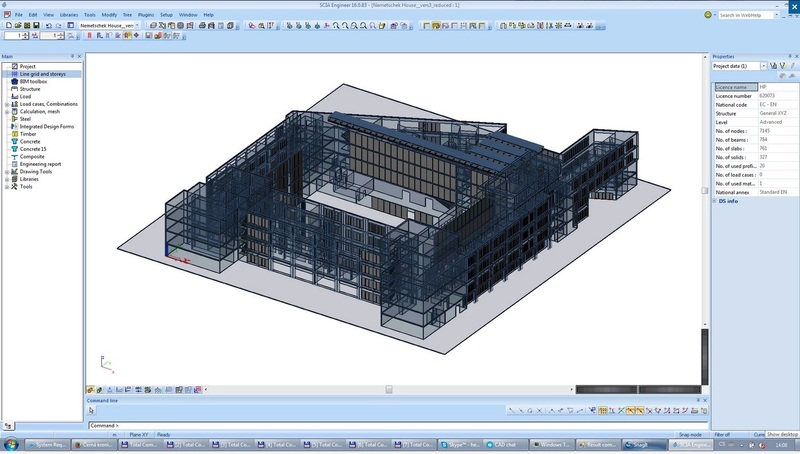 Belgium-based SCIA, a Nemetschek Group company, has this week announced SCIA Engineer 16, the latest version of its global leading structural design software that supports the BIM process in the building industry. SCIA Engineer 16, with a focus on usability, has released its updated application with more than 350 updates and new features. Important new enhancements focus on concrete and steel design. The result is an improved structural design program that provides engineers with a faster and easier way to delivery quality results. 01 – SCIA Engineer 16’s many improvements include new graphical representations of strains and stresses in members, and include new mark highlight feature for exact values in a 3D model highlighting table result values as shown here. For more information on SCIA Engineer 16, or to download a FREE trial, please visit https://www.scia.net/SE16. SCIA Engineer is an impressive piece of software engineering. While there several globally important structural engineering software packages for structural engineering and design, SCIA Engineer has largely stood out for sometime for its true BIM orientation. This is not a tool that competes with Revit Structure, if readers are curious. SCIA integrates structural modeling, structural analysis, code design and reporting. Uniquely, SCIA Engineer 16 is the only engineering and analysis tool that is IFC 2×3 certified, says Dan Monaghan, Managing Director of SCIA in North America. 01 – New IFC capabilities in SCIA Engineer 16 focus on ALLPLAN integration improvements. SCIA Engineer 16 is IFX 2×3 certified, the only such software in its class to be so. In this release, the IFC workflow improves on what before was an existing XML link between SCIA Engineer and ALLPLAN, a popular sequence of tools with engineers and architects in Europe. The issue solved in this version with XML is that the IFC is more stable, whereas before when ALLPLAN updated or SCIA updated it often meant the XML link, which was proprietary, needed to be updated or fixed to work again. SCIA Engineer 16’s additional IFC features means that there are unique tools that enable users to convert IFC objects into native SCIA Engineer objects and to clean those objects up.